Scrapping of planned coal power and accelerated investment in wind and solar are essential if we are to reach the Paris climate goals. The good news: It can be done significantly cheaper than the International Energy Agency (IEA) estimates, writes Terje Osmundsen, Senior Vice President of the Norwegian-based international solar power company Scatec Solar. Courtesy of EnergiogKlima. If Turkey, Indonesia, Japan, Bangladesh, Pakistan, Vietnam, Thailand, South Korea and a few other countries follow the path of China and India and start to put coal developments in the freezer, the world could be saved from devastating climate change. Wind and solar can contribute to almost half of the CO2 cuts required to keep global warming below the 2°C target, if we achieve an average yearly growth rate of 12 and 18% respectively until 2030. 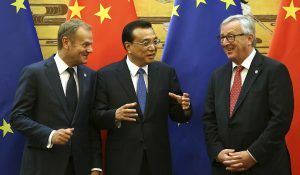 The cost of reaching these goals is lower than told by the International Energy Agency (IEA) to the G20 Ministers who met in Baden-Baden in Germany mid-March. The first of the two reports, “Investment needs for a Low-Carbon Energy System”, was published jointly by IEA and the International Renewable Energy Agency (IRENA) on the occasion of the G20 meeting in Germany. The second report, “Boom and Bust 2017: Tracking the Global Coal Pipeline”, was issued by the NGO’s CoalSwarm, Sierra Club and Greenpeace. The IEA/IRENA report starts with the target to limit – with a 66% probability – global warming to 2°C. This scenario “would require an unparalleled ramp up of all low-carbon technologies in all countries”, it says. 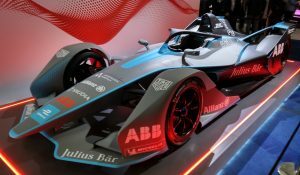 By 2050, nearly 95% of world electricity production would be low-carbon, 70% of new cars would be electric and the entire existing building stock would have been retrofitted. Furthermore, the CO2 intensity of the industrial sector would be 80% lower than today. Following this growth path, wind and solar combined would become the largest source of electricity by 2030. This would require ”a major effort to redesign electricity markets to integrate large shares of variable renewables, alongside rules and technologies to ensure flexibility”. IEA estimates that $40 trillion must be invested in the electricity sector to support this transformation between 2015 and 2050, compared to an estimated 28 trillion in the IEA’s reference “New Policies” scenario. About half of that, i.e. 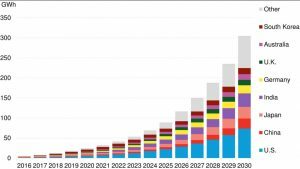 $20 trillion, would be spent on renewables and the rest on investments in the grid, batteries etc. Wind and solar would each need to attract about $7 trillion, according to IEA. As a result of this massive green investment boom, the IEA scenario reckons total installed capacity of wind and solar in the world would increase 11-fold, from about 650 GW in 2015 to 7130 GW in 2050. The carbon intensity of the power sector would be reduced from 516 g CO2 per kWh in 2014 to only 117 in 2030, and as low as 30 gram CO2 in 2050. Besides renewables, the main driving force is here an accelerated phasing out of coal as well as an intermediary rise in natural gas as source in power generation. 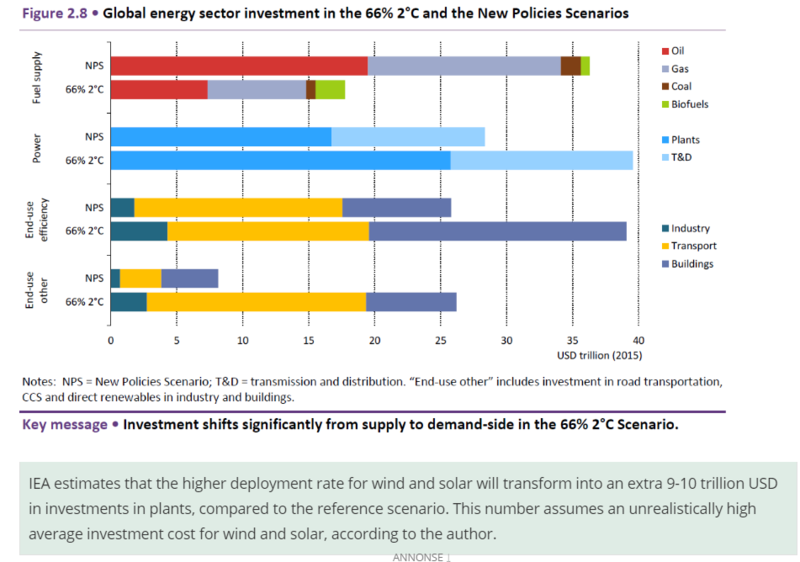 To put these numbers into perspective, IEA calculates that the 66% 2°C scenario will require 40% higher total investments in the energy sector compared to the New Policies Scenario. On the other hand, the import bill for the net importing countries will be drastically reduced. IEA estimates that the net savings for 20 largest economies will amount to $1.6 trillion, as a consequence of reduced import of coal, gas and oil in the power generation sector. 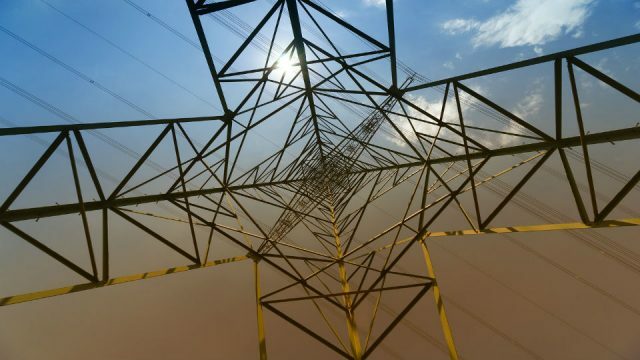 All in all, IEA estimates that when combining the higher investments with fuel savings, the net cumulative cost of the global power system (including transmission and distribution) to 2050 would be around 15% higher in the 66% 2°C scenario than in the reference scenario. However, it seems that IEA once again significantly overestimates the costs of large-scale deployment of solar and wind energy (I have previously pointed out how IEA repeatedly has underestimated cost reductions in solar PV). Let’s do the math: To reach 7130 GW wind and solar in 2050, starting with about 700 GW in 2015 and conservatively adding 5% for replacement of “decommissioned” plants, you need to build on average about 190 GW a year. This is certainly a high number, but note that it’s only 50% higher than the 130 GW built in 2016. To build an average of 190 GW solar and wind a year the next 35 years IEA reckons we’ll need $14 trillion in investments, i.e. $400 billion per year. $400 billion for 190 GW translates into an average assumed investment cost the next 35 years for wind and solar of more than $2 million per MW. But $2 million per MW is not only higher than it costs to build solar and wind today, it fails to take into account the effect of the industry’s continuous cost reductions, especially the solar PV sector. As an illustration, the table below shows that – according to Bloomberg data – the average global investment cost for wind and solar fell by about 60% the last two years, from $2.7 to 1.7 million per MW. 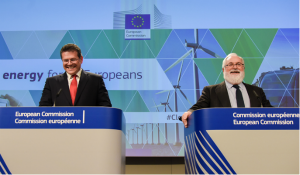 Both the wind and in particular the solar industry will continue to reduce costs, especially if we assume – as IEA does in its 2°C scenario – a yearly growth of staggering 12 and 18% respectively for wind and solar the next 15 years. With system costs for utility PV projected to drop 5-10% per year at least until 2030, it seems reasonable to assume an average investment cost below $1 million per MW the next 35 years, i.e. less than half of what assumed by IEA. In other words, the ”extra” investments in the power sector required to meet the 2°C scenario with at least 66% probability is not $9-10 trillion as estimated by IEA, but rather probably closer to half this amount – equal to about $150 billion a year instead of the approximate $300 billion bill presented by IEA. By the way, we should note that these numbers are excluding the significant net savings from reduced fossil fuel imports in the same scenario. 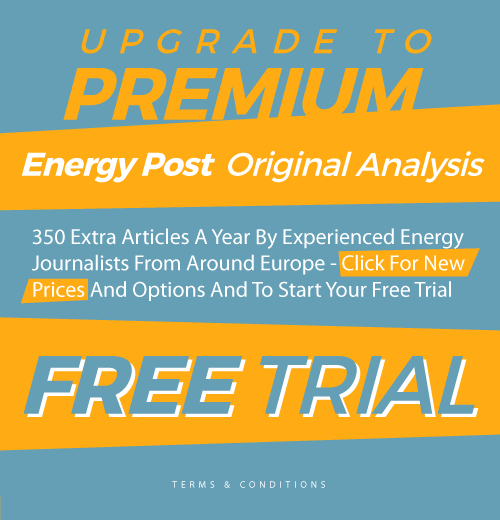 They are therefore significant, because they illustrate that the sustainable low-carbon scenario required to meet the Paris goals is significantly cheaper than communicated by IEA. The IEA/IRENA report highlights the importance of an accelerated phase-out of coal in the electricity sector. The report “Global Coal Plant Tracker 2016”, published in March by CoalSwarm, describes the nature of this challenge. It starts by painting a surprisingly optimistic picture: “After a decade of unprecedented expansion, the amount of coal power capacity under development worldwide saw a dramatic drop in 2016″. The main reason is China and India, which saw 68 GW of construction now frozen at over 100 project sites, and an equal amount retired. Overall, the pipeline of new coal fired power plants was cut in half from 2015 to 2016, from 1100 to 560 GW, and the number of construction starts reduced by 62%. “The slowdown in the coal power pipeline brings the possibility of holding global warming to below 2°C from pre-industrial levels within feasible reach”, concludes the report optimistically. However, it remains to be seen whether the drop observed in 2016 reflects a trend, or just a one-time adaptation to oversupply of power in India and shifting economic priorities in China. 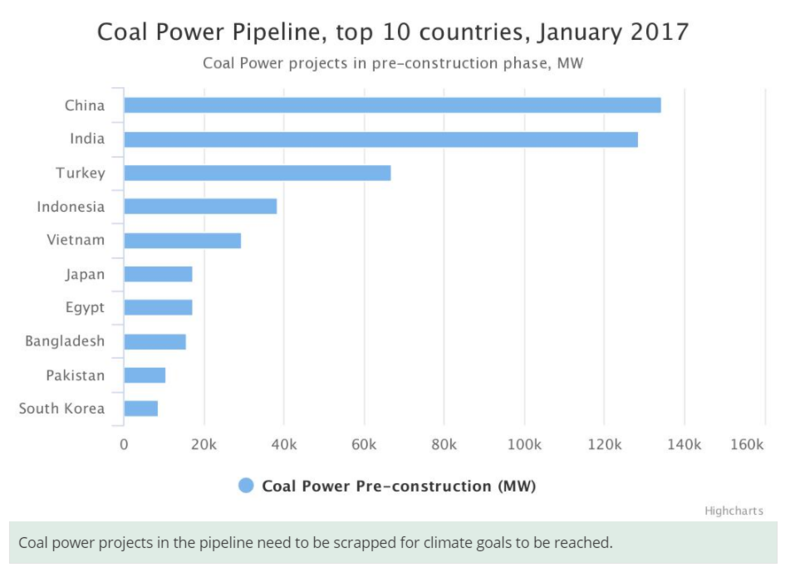 According to the report, the “top 30 countries” still had more than 550 GW of new coal power plants under development, in addition to 250 GW under construction. That means these 30 countries still had about 550 new coal plants in the pipeline, if we assume that each coal plant on average has a capacity of 1 GW. Other than China and India, the top 10 “pipeline countries” are: Turkey, Indonesia, Vietnam, Japan, Egypt, Bangladesh, Pakistan, South Korea, South Africa and Philippines. The good news is that none of these countries are dependent on coal power for the security of energy supply at competitive prices. Almost all the top 10 coal countries have abundant solar resources, and most have also access to good wind resources. In all these countries, possibly with the exception of Japan, solar and wind power can be supplied at a cost per kilowatthour that is competitive with, if not lower than electricity generated from new coal-fired plants. So why are these countries still betting their energy future on coal? I think the answer has to do with the perception that only large centralized conventional power plants can provide the “baseload” power required to secure the countries’ economic development. That used to be the case, but it’s no longer so. As the experience from Scandinavia, Germany and California shows, the required security and flexibility of supply can be achieved through a combination of, among others, large-scale deployment of renewables, enlarged cross-border interconnection capacity and various forms of storage, supplemented by gas-fired peaking plants. Hopefully, the examples set by China and India last year can serve as a model for the remaining countries betting their future on coal. A modest carbon tax would have been sufficient to accelerate the phasing-out of coal, also in the top 10 coal countries. As a substitute, it is now important that the new sources of “climate finance” committed in the Paris treaty, are not dispersed into myriads of initiatives that may keep diplomats and development agencies busy but fail to deliver result-based investments on the ground. An initiative expected to be launched by the Norwegian government later this year, can serve as an example. The proposal is to set up a facility that will offer partial credit risk guarantee products to renewable energy projects in the developing countries, provided the projects can offer certified CO2-emisson reductions. The initiative is meant to incentivize the market, for example by stimulating private banks and emitters of green bonds to take a more active role in financing renewable energy projects in developing countries. More innovation is certainly required if we want to stimulate market-based alternatives to the more than 500 coal plants still in the pipeline. See also Greg Muttitt, Why the International Energy Agency still gets it wrong on fossil fuels and Terje Osmundsen, How the IEA exaggerates the costs and underestimates the growth of solar power. 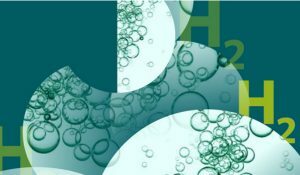 Industrial CCS (steel, cement, …) is an important element in both studies. In the IEA case the coal and gas CCS contributions ramp up between 2030 and 2040, as the last coal contributions without CCS die out. Significant R&D on CCS for cost reduction is assumed. The IRENA study says that CCS for power generation was excluded on cost considerations which lead to a perception of high risk. The paper is worth reading, but a project at 200 pages. My provisional summary is that coal generation with CCS might be useful, may or may not make financial sense, and will not play a large role in future electricity generation. Industrial CCS will be necessary. I am pretty sure IRENA will prove right on CCS in power generation, not IEA. The real question is how to solve the seasonal storage needs, when solar and Wind will cover more than 50 % of power demand.